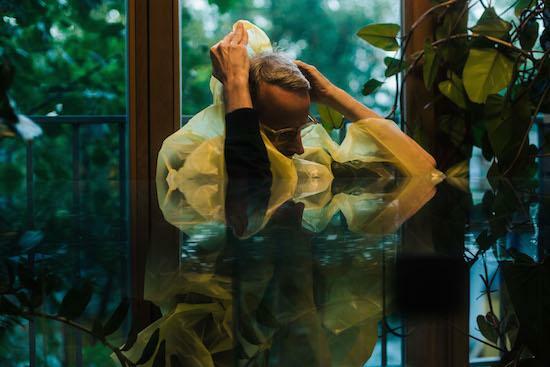 The adjective that encapsulates the sound of Errorsmith productions, from his solo work to collaborations with Fiedel and Frank Timm, is ‘springy’. Nowhere is this feeling of bounce and hyperactive energy more present than in his new record for Pan, Superlative Fatigue. The last album-length record Erik Wiegand released was 2004’s Near Disco Dawn, a record of feral techno bangers recorded live between 2001-2003. It is the sort of record to take out as a 'just-in-case' for when the dancefloor really kicks off: molten party bangers that are noisy, messy, and all recorded live, the energy of a dancefloor pressed to wax. It is the record that stomps in on elephant feet, four tons of beats wearing bendy synth stabs like tinsel. Superlative Fatigue is a completely different beast. It is more lean, its bassy synth stabs more athletic and joyful, with tracks like 'I’m Interesting, Cheerful And Sociable' nodding more to his work with Fiedel as MMM. In between times he built a plugin synthesizer called Razor for Native Instruments, and classes Superlative Fatigue as his first proper release using what he built. His love for live performance remains though, with plans to add a new track to his live set at each forthcoming show. Wiegand is happier playing live than producing in the hermetically sealed environment of a studio, and has been DJing and making music in and around the Berlin club scene since the mid-1990s, through collaborations like the disco-inflected Smith N Hack project with friend and long-time collaborator Frank Timm, and MMM, his ongoing collaboration with Berghain resident Fiedel. Over Skype Wiegand is not giddy like his tracks, but thoughtful and reflective about his work, perceptive about the details and context of his music, with a taste for tension that manifests in a feeling that things can being absolutely serious, even if it sounds like they are drenched in a mischievous humour. It's easy to get caught up in details and anecdotes in interviews, but I want to start with asking a really core question: Why do you make music? Erik Wiegand: We are social human beings, so making music is a way to contribute to society, to feel needed, to feel necessary. We need this. My driving force is the fun of doing something creative, being a valuable member of society, and getting feedback. That's a very simple answer, but it's a very basic human thing. How did you get started making dance music? EW: I was born into a musical family: my father used to play in wedding bands so he had a home studio with synthesizers that I had access to, and I learned to play the drums when I was a teenager. Then I moved to Berlin and got my own little studio. In 1994 I met Fiedel and we started to make music as MMM. The first time you have a little success, some good feedback, you start imagining having a career, or being a professional musician. But while being creative, or doing creative work, is very natural for humans, to think of that as your main occupation, that's a really important transition. Superlative Fatigue is your first solo album in 13 years. Can you tell me about the genesis of the record? EW: It was time for me to prove to myself that I was able to finish an album, or any music, as Errorsmith. In 2011 I released a synthesizer with Native Instruments called Razor, and I made records with other people like Fiedel as MMM, and a record with Mark Fell in 2015. But for me it's very difficult to finish music on my own. So I was really strict, I gathered eight sketches I'd made and focused on finishing these over the last six years. It becomes very easy for me to only do the synthesis work and not finish any music, but it wasn't good for my self esteem, because I see myself as a musician. I'm only doing this synthesis work to make music, and I dream of using these things, so if it doesn't happen, it doesn't feel good. In terms of what stops you finishing tracks is it literally the distraction of the coding or is there some creative block? Is there a fear of completing something? EW: It's the fear of losing the fun. It's very easy to get a sketch of something or an idea together in a very short time, to try out something new, but to get a five minute track to play out is much harder, at least for me. When I start to construct something, it often ends in frustration. When you talk about the ideas in a sketch, do you mean that sonically or conceptually? EW: Almost every track is based around something played manually on the keyboard or something I sang. I was looking for things that had a little bit of a hyperbole, or were exaggerated, or where you don't know whether I am being serious or not. I really like these conflicting emotions. A track can be cheerful or sad or aggressive, or all of these things at the same time. I like these kinds of tensions. The stuff I made with MMM or Smith N Hack had this kind of tongue-in-cheek element to it, but it was also serious: you could see it both ways. Is that your own voice in 'My Party'? EW: Yes. I sang it all in one go, this little chorus, "Party, my body", then I used the vocoder in Razor. I switched between settings to make it sound like switching between different characters. But because I'm singing all the way through I lose my breath at the end. You can really hear it, it's funny, it sounds like these little androids got too excited jumping around, and get out of breath, it comes out quite adorable somehow. Where are your track and album titles from? There's one I really like: 'I'm Interesting, Cheerful And Sociable'. EW: I collect words and phrases that I stumble upon online, so I choose from these collections, and they add something new, opening up an image maybe. Choosing them is more like a feeling: do they fit or not? 'I'm Interesting, Cheerful And Sociable' is from an article about a dating site. It's such an artificial description of yourself, it almost doesn't sound like a human wrote it. The main sound is the opposite of that description 'interesting cheerful and sociable' – it sounds like a character with a very unstable state of mind. It's very hysterical and then it has an epic breakdown. Since naming it, I think of that main sound as a character. But I feel the album title, Superlative Fatigue, is really depressing. EW: I don't see it as negative like that. It is very fitting for the time in which we live, this attention economy, especially in the music world. Everybody is fighting for attention and sometimes you really feel overwhelmed, everyone is hyping themselves up so much, and in the end it wears [people] out. I read it somewhere about Trump, because he really loves to use superlatives. But I don't see it as negative, because when using these superlatives to describe things wears out, what is left is reality, which is a good thing. Can you tell me a little bit about the artwork, by artist and musician James Hoff? How did that come about? EW: Bill Kouligas, who runs Pan, asked me what my ideas were for the cover, and I'm not a very visual person, but I said it could be something colourful and maybe even cheesy. In terms of being colourful and bright, Bill suggested James Hoff who has released music on Pan and Bill knows his visual work of course, so within a day James had sent some of his computer-generated art. It was a magical moment. I didn't know about his work before, but this visual work is generated using Russian malware called Grizzly Steppe. I really have to interview him about it, because I don't know how he can make such a colourful painting with something like malware. One of the things I want to ask about is Razor, which obviously you've mentioned and I know you've talked about it before, but can you explain in layman's terms, for a non-musician, what it is? EW: It's a software synthesizer plugin that uses additive synthesis. That means the sound is created by adding lots of sinewaves with a certain amplitude and certain frequencies. It's a very powerful technique to sculpt the spectrum of the sound, meaning you can essentially change the atoms of the sound through manipulating the sine waves that constitute the overall sound. This additive approach meant I could add some features that you couldn't find in previous synthesizers. What prompted you to build it in the first place? EW: I do my own synthesis research and I had this idea for this particular synthesizer and I convinced Native Instruments to put it out as a plugin. I put a lot of my own taste into it, so while I made Razor for other people, it reflects very much my own taste in music making. For example, there are unique ways to make the sound disharmonic or dissonant. The sound of the album is reflected by the capabilities of the synthesizer. Superlative Fatigue uses almost entirely Razor, and it was a joy to use it, finally! I really enjoy making and creating synthesizers, but it was a very special release because it's not music that people consume but something people can be creative with. When you can inspire other people to do something they couldn't do before, that's a very satisfying feeling. Sometimes I meet people and they're over the top excited to tell me how much they love Razor. There is no shortage of synthesizers out there, every week there's a new synthesizer, especially plugins – there is a lot of competition – so if you make somebody really excited about synthesizer it really feels good, so it's a source of a lot of pride and satisfaction. Do you enjoy playing live and is it easy for you? EW: I enjoy playing live a lot. In the studio I record the live jam, and that's the basis of the studio version. So bringing my studio tracks live is almost the same thing. Is that the same production process as you used for Near Disco Dawn? EW: That is a collection of purely live recordings, but what I want to do in the future is to record a sort of enhanced live version, where I record the automation and MIDI from a live performance. Near Disco Dawn sounds very rough, it has this live appeal, but what I have in my mind, it should feel like a proper studio version. When I play live, it doesn't look like I'm interacting with the crowd that much because I'm looking at the controllers and I'm concentrating, but I really like it, for me it's easier to play live than to work in the studio, it's more natural to be on stage improvising. Is making people dance one of your main motivations for making music? EW: There is more to it. I do it mainly just for myself in the beginning, and of course it's great when I get a reaction, but I'm more interested in hearing something unusual to my ears, and that's what I'm also looking for in other people's music. It's not interesting to look for a sound that is made to make everyone on the planet move – I wanna have both, I want something danceable but very creative and unusual. Jlin is a prime example of something that is very unique, she has a very personal style, and it's crazily intricate and complex, but it's still very danceable, and it's so cool to see something like this be so successful, it fills me with joy to see this. Often I feel a bit bored when I go out and the default sound is so uniform. You hear something and you can't tell if it's from now, if it's one year old or two, or four or even twenty years old. It's just a copy of a copy of a copy, it's very boring, so if something breaks out of this norm that keeps me alive. I really need this kind of input, and it's a rare, rare thing. On that note, it's a good place to ask about collaboration. Is there something about collaboration that gives you the same sort of feeling? While this is your first solo album for 13 years, you've done a lot of collaborative work in that time. EW: The positive thing about collaborating is that I cannot get distracted by coding work, because I cannot waste the other collaborator's time in the same way as I can my own. That's the good side, and the other good side is that it's always good to learn how the other person works, learn about techniques, learn social things like: how do you communicate with another person? The music I make with other people I'm much more confident about, I'm a little bit less judgemental of the outcome than with my own stuff because I know it's not only me, it's a more outside of me. Sometimes I even like them better than my own tracks. At the risk of asking you a terrifying question given you just spent six years on a record, what are you working on now that is coming up on the future, collaborations or solo? EW: I want to extend my live set, I'll be playing more shows after the album release and I'm planning to put a new track in with every set so it's constantly changing. I'm also working on an album with MMM but there's still quite a bit to go. There's no release date, maybe next year, hopefully, or maybe in five years... Not really, I'm joking, but we're working on it!